Where are all the female artists? At the age of 12, Angela Ninda Soko was already using her artistic talent to earn a bit of pocket money. By creating greeting, birthday and Christmas cards, on a good day, she would have more than a few coins to spare, and it was at this tender age that she was once able to buy two pairs of not-so-cheap spectacles, one for herself and one for her mother. 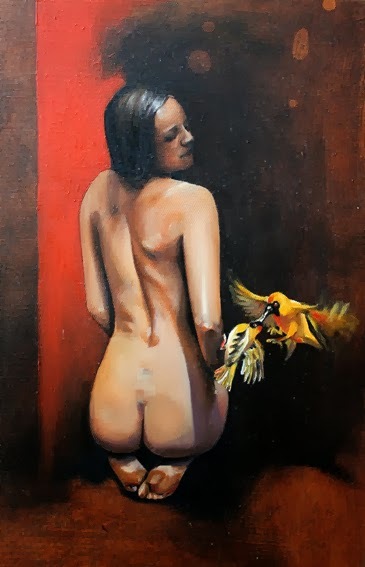 Noticing Angela’s artistic promise, her mother, a widowed and single parent at the time continued to support the girl’s creative endeavours eventually encouraging her to enrol at the Evelyn Hone College to study for an Art Teachers Diploma after high school. But her enrolment in the college was not all smooth sailing. Her mother could only manage to sponsor her first term but fortunately, she was not the only one alert to Angela’s talent. 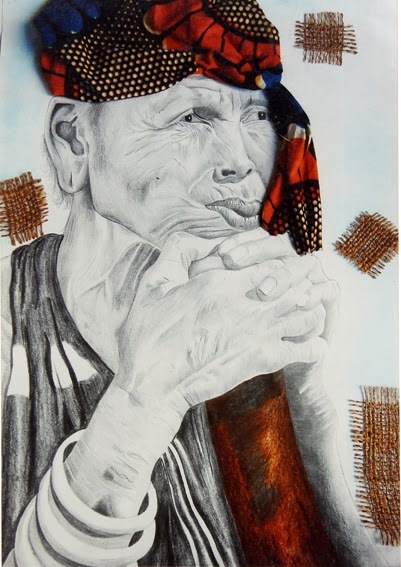 The young artist was spotted by the Lechwe Trust who had a long standing commitment towards sponsoring art students within the Evelyn Hone College and other institutions. “From term two onwards I was sponsored by the Lechwe trust. This is when I went into sculpture – as a medium -- I had never done it before but just took up the challenge. It was the best experience ever. 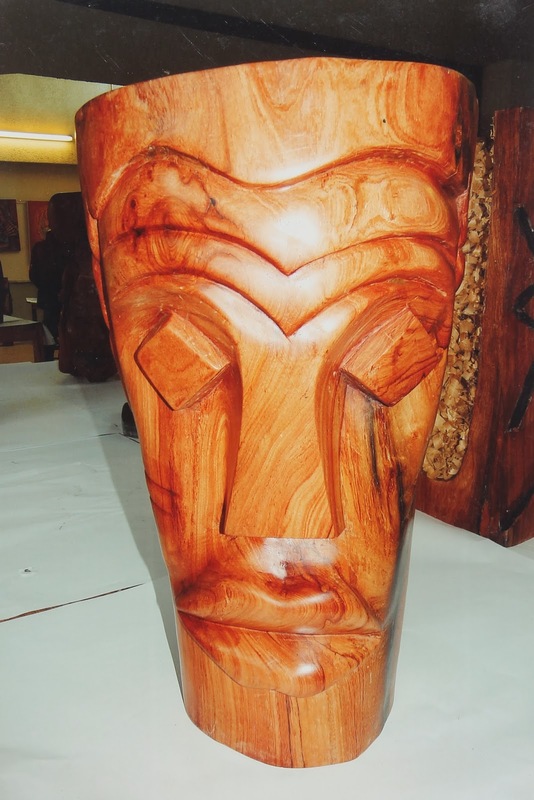 In the first year I was blessed to be part of a workshop sponsored by the Netherlands and I did three pieces and two were actually sold,” explains the artist who had the opportunity to meet and be tutored by leading Zambian sculptor Eddie Mumba, who was one of the key people conducting the workshop. Her two pieces from the workshop were sold for K4,500 – formerly K4.5 million – each giving her a total of K9,000 – formerly K 9 million – which in 2009 was a fairly reasonable amount of money that she says saw her through school; for things such as transport and pocket allowance while supplementing the money an uncle would send monthly. “But I just didn’t make a little money in this workshop. I was glad to meet Mulenga Mulenga too; she and I were the only females on the programme. But most of all I used the workshop to my advantage to lobby for a room on the college campus. After the workshop I was able to convince the Dean that I was working hard and had to be accommodated on the premises,” she explains. Motivated by the successful workshop and bubbling with confidence, she would subsequently enjoy a fruitful stay at the college graduating best in her school for the class of 2011 for which she was honoured. A year later, she returned to Kabwe, one of the towns she grew up in, there she opened a small shop called Artlands Creative with her fiancé. She would help manage the business and at the same time she would conduct art classes for disadvantaged children at Chemo, a school founded and ran by her mother, who had now found success after working in South Africa for a few years. Recently married, Angela is now a teacher in Kapiri Mposhi, but often commutes between that town and Kabwe. “In 2013 I was posted at Kapiri Girls Technical School. I teach an art class but I only have 11 pupils and they are all in grade 11. But I also formed an art club which has 28 members and I feel honoured because I was initially teaching English, but now my school is very supportive of what I’m doing and they are even budgeting and providing art materials,” she says. From how she fondly speaks about her practice as a teacher it is plain to see the enthusiasm is very much part of her drive and focus. But one might speculate that this has also drawn her away from the gallery circuit which is seriously lacking the contribution of female artists, particularly those such as Angela that are also sculptors. 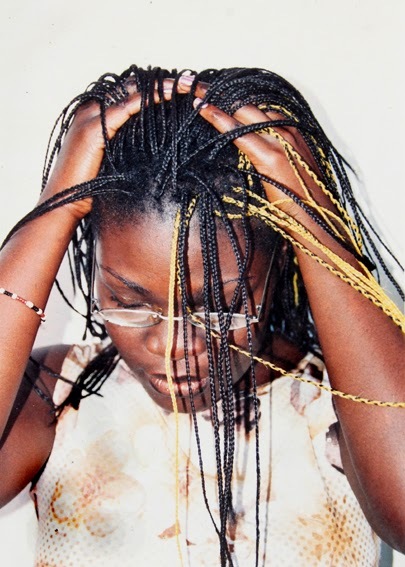 As much as a few higher learning institutions such as the Evelyn Hone College and the Zambia Open University – where Angela recently enrolled as a first year BA Fine Arts Student—are churning out fresh art graduates every year and many other informally trained artists are emerging on the scene, we see fewer female artists actively involved in art practice and even less more exhibiting. There is no telling why this is so, one can speculate that after marriage they are discouraged by the uncompromising husband who will rather have a spouse in a different field, a housewife or an outright procreation partner. In fact it is so frustrating that we are lead to believe that Zambia has no female artists. About four years ago, the Lusaka National Museum hosted the International Women's Day Exhibition 2010 -- by all means a landmark show in this country’s art history – which managed to showcase works by over 40 women, including our featured artist Angela herself that were actively producing art at the time. For records sake, one is tempted here to call them out and probably remind them of their creative vocation; these are namely Vandita Varjanhbay, Bridget Sakwana, Angela Kalunga, Caroline Miyoba, Gift Nondo, Karin Cocker, Tamryn Pohl, Nan Van Ginkel, Laurey Nevers, Constance Mundui, Helen B. Mulubwa, Olipa Mumpuka, Agness Lubumbashi, Sylvia Mwando, Gladys Kalichini, Cynthia Zukas, Agness Yombwe, Sue Somerset, Misozi Moyo, Brigitte, Zarina Khan, Tessie Lombe, Eva Middleton, Phylis Konoso, Eunice Walker, K Cocker, Mulenga Mulenga, Kamwala Kaoma, Akakulubelwa A. Shawa, Jaquiline Musonda, Ngambi, Christabel B Banda, Rhoda Phiri, Petronella Ngolwa, BM, Mirriam Kaleyi, Ellen Hitas, Mumpa D. Chanda, Lillian Mwemba Himoonde, Stella N. Banda, Susan Mbao and Kalcho Group. In recollection the show which ran for two weeks did not sell much, but in line with the Women's Day theme for 2010 which was "Equal Rights, Equal Opportunities”, it was a resounding success having exposed female artists from different cultures, generations, social and educational backgrounds. It begs the question “Where are all the female artists?” Who can best address the challenges of a woman, or celebrate motherhood, beauty or indeed women’s rights or the feminist movement in art more convincingly than the woman herself. Nevertheless this is not to say there is no one keeping the female flame alive in terms of artistic presence, right now we only have a handful namely Laura Chimowitz, Agnes Buya Yombwe, Caroline Miyoba, and the younger crop of Mulenga Mulenga, Gladys Kalichini, Nukwase Tembo and Alina Mateke. 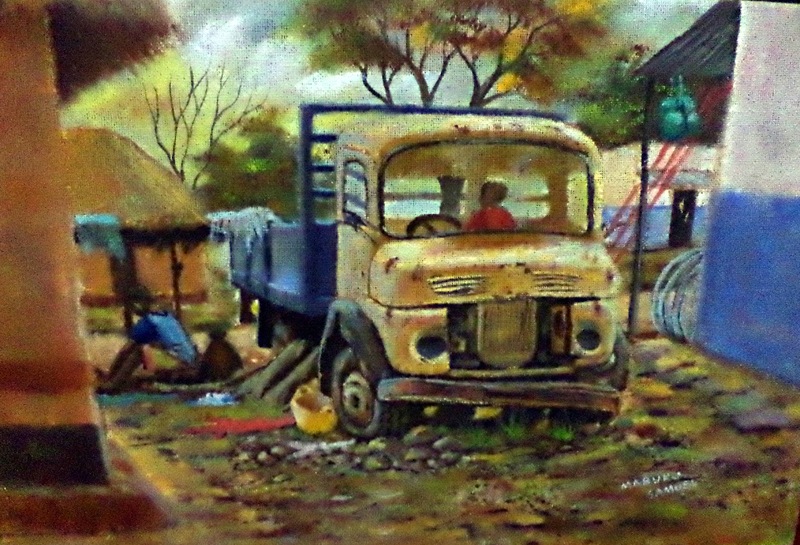 Of course there is the Ababa House group of hobby painters mainly of European or either Zimbabwean extraction as well as the Sunday painters of Choma who are mainly farm wives but are able to exhibit nonetheless. But anyway we digress. Back to Angela, her works Thinking and Weeping Drummer are remarkable pieces, one a mixed media drawing and the other a rosewood sculpture but it does not look like the art viewing public should be expecting anything new from her any time soon. It is possible that she too like many others before and among her will be engrossed in the daily humdrum of being an art teacher – which is not entirely a bad thing – but why not practice and exhibit professionally while you still have your art teaching to lean on when sales are low or exhibitions are not frequent. It would be good for her not to give up working in wood or stone – rare materials among female artists -- while she still has the zeal and energy, which one might add is not hard to lose, and once it is gone, it seldom returns, unless of course with inspired effort. The motivation for a Cape Town-based wanderer André Pilz to cycle across Africa is somewhat foggy and his concept is not that easy to follow. 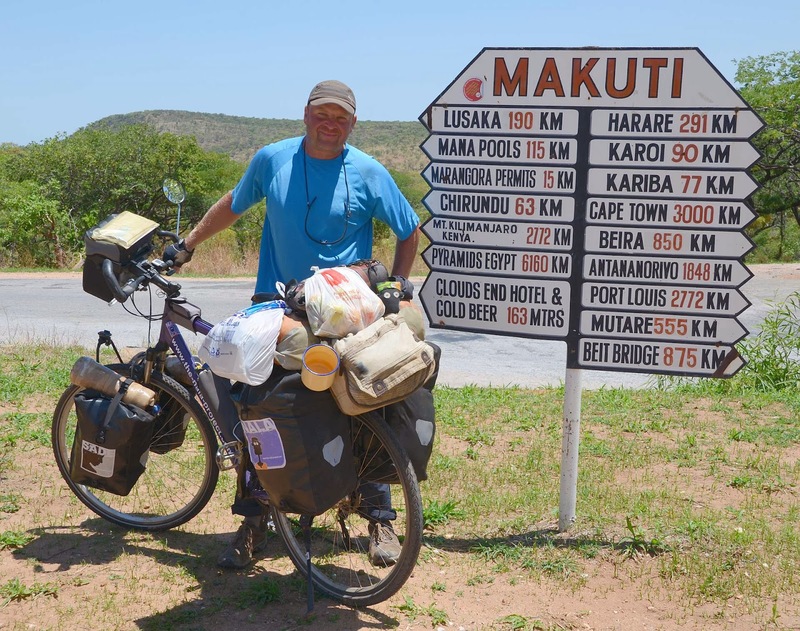 But seeing he has already cycled about 7,000 kilometres from the Cape, through Namibia and Zimbabwe into Zambia having started his journey in April last year it appears he is quite determined to continue until he reaches the journey’s designated end in London on an open-ended date. Pilz appears driven to cycling across the continent mainly by an obsession with the sensual, Nigerian-born, British singer-songwriter Sade – famous for songs such as “No Ordinary Love” and “Smooth Operator” who’s music he has been listening to passionately for about 30 years. He believes that at the end of this expedition he just might get the chance to meet his muse and idol to whom he hopes to present a fan book, with messages thanking her for the music as well as honouring her with an exhibition of art with paintings and sculptures by artists from all the countries he is to visit. “I’m originally from Germany but I’ve lived for 8 years in Cape Town trying to make it as an artist. My idea for cycling across Africa is inspired by the music of Sade. I decided to come up with a fan book and I have collected messages, when I reach England I hope to give her the book and say thank you for the music,” he says. 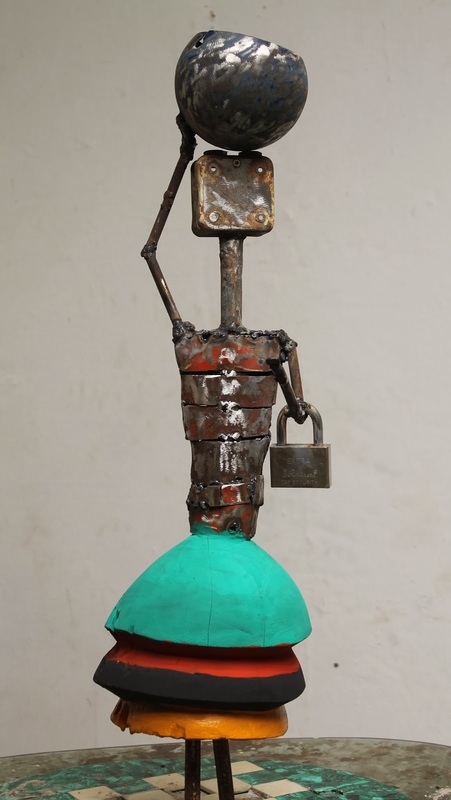 His attempt to penetrate the competitive Cape Town gallery circuit was met with continuous rejection and no amount of inspiration by Sade’s music could help, although it did inspire the creation of a character called Nala, his imaginary friend. One might light-heartedly say Nala is the lovechild of Sade’s music and Pilz’s visual art. “Whilst listening to the music -- Sade´s song “Sally” was playing in the radio -- I created a little character called Nala. She is a 6-year-old girl who has a dream to see what is behind the mountains [of Cape Town] that she views outside her kitchen window,” he says. A bit of a mouthful, but that is the dream of an imaginary girl named Nala, probably Pilz’s dream too, because where he goes, she goes. But while he has creative license and the right to stretch his elastic imagination, any culturally sensitive African would argue that it is not possible – unless under a serious case of abuse -- for a six-year-old girl, let alone any child to wash her father’s underwear. In cultures across Zambia for instance, washing of the man of the house’s underwear is the preserve of the lady of the house as chauvinistic as it might appear, it is an act of respect, love and marital responsibility. Not even the house help gets to touch or see these prized garments so they cannot even be put on the clothes line for all to see, which again is contrary to Nala’s case. But again Nala’s case is peculiar; anything is possible from a ‘daddy’ that wears pink underwear. It’s a pity though that at face value, non-Africans that visit the site may assume that washing of the father’s underwear is a common chore among African children. Anyway, Nala managed to leave her village in Cape Town; she is currently in Zambia with Pilz. Just as Namibian and Zimbabwean artists created their own renditions of her, Zambian artists had a go too and our lads at the Art Academy without Walls (AAWW) in the Lusaka Show grounds who have been quite busy over the past two weeks made a very creative contribution towards the project, all in their trademark styles. “For the Nala project I work with artists in the country’s that I visit. Later I will collect the artworks and send them to Cape Town or Germany, but I intend to have a large Nala exhibition in London, and I really hope Sade can come and see or even open this exhibition,” explains Pilz who does not yet have a venue because he may still have another year and a half of cycling at hand. From Pilz’s original painting, Nala has dark skin, a four-sided head with round ears, large round inquisitive eyes, no nose or mouth and the artists at AAWW have tried to stick to the concept except for Christopher Simbule who depicts her with a rounded head, and narrow ears and eyes at a bus stop taking a photo of herself with a cell phone. Gordon Shamulenge’s Nala however, -- as does the rest -- adheres to Pilz’s facial concept; she is depicted receiving flowers from a person made of drums and drinking gourds. 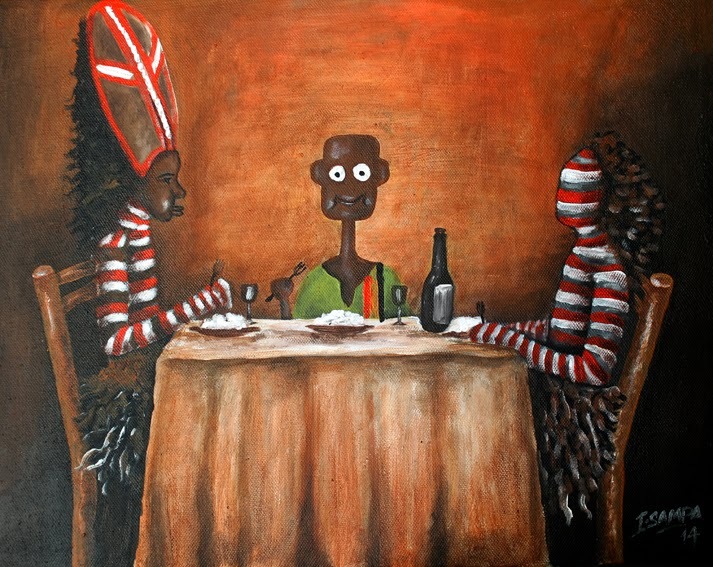 Ignatius Sampa’s is seated at the dinner table with a Nyau couple; Mapopa Manda’s is on the front page of a Zambian newspaper alongside magazine cuttings of Sade. 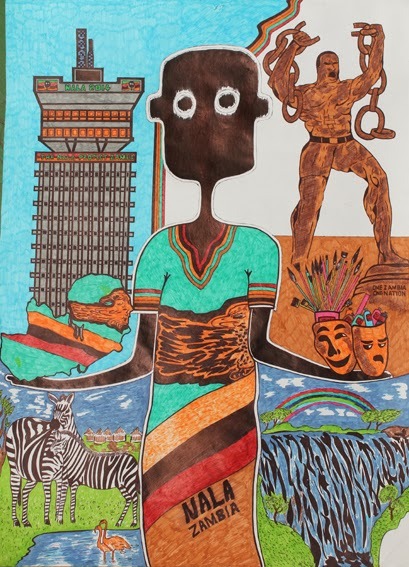 Poster artist Steven Mwansa depicts her surrounded by iconic Zambian imagery such as the Freedom Statue and the Mosi-oa-Tunya. 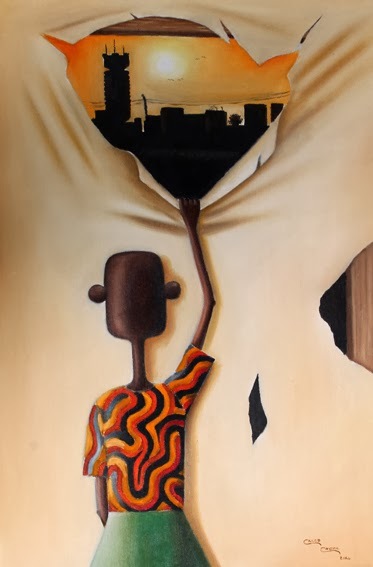 Caleb Chisha’s faces away from the viewer and she is tearing down a canvas that shows either a sunset or sunrise over the Lusaka skyline. 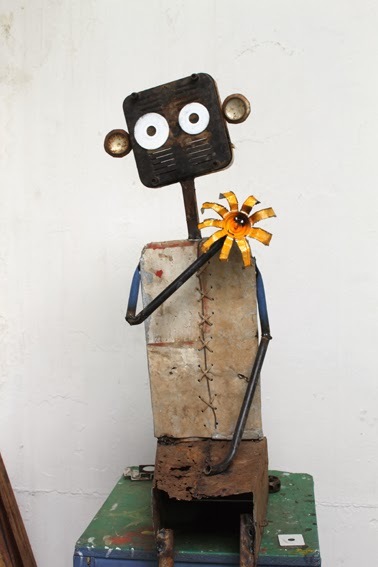 Both Joseph Shakulipa and Owen Shikabeta have very resourceful and imaginative versions using scrap metal and found objects. Without doubt this is a very creative crop of young Zambian artists and seeing they have all done the work voluntarily and at their own cost; canvas, paints and all, one can only hope that the exhibition does come to fruition and the artists do get some exposure although it is not clear whether the works will also be on sale in London. One worrying factor is that if he has accumulated 10 artworks in Zambia alone, how many should we expect him to have at the end of the journey and will he afford or indeed manage to ferry these to the exhibition venue seeing he has no corporate or consular support? “Now I intend to cycle to Malawi and also Tanzania, around the Congo to Uganda, through the Central African Republic, Cameroon and Nigeria… and well it is quite safe I have never had any problems apart from the huge trucks and some animals sometimes, sometimes I sleep next to the road in the bush, or in backpackers and at times with good Samaritans like one where I slept in Bulawayo or in Kafue,” he says. But he is still not sure whether he should go east or north, he says he still wants to see more of Zambia. Nevertheless, we can only wish him luck especially as he plans to ride through treacherous terrain. We can also wish him all the best, and hope that he will fulfil his dream to see Sade, hold the Nala exhibition and obviously write a book to his own glory and benefit as has been the case -- since the Berlin conference itself -- when European adventurers trek through the continent. He first caught our attention as a gawky, bespectacled young student when he was the outspoken chairman of the Evelyn Hone College Art Club while attending his first year in the Art Teachers Diploma Course in 2008 and appealed to Charles Chambata and other non-academia artists for mentorship, voicing his earnest appeal through this column. 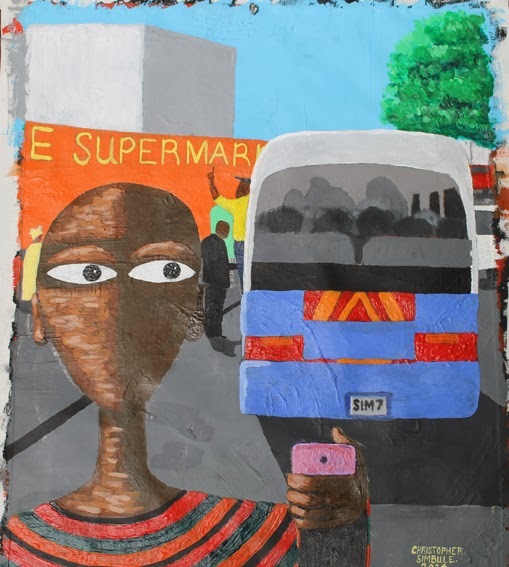 Five years down the line, Samuel Mabuku has graduated and enjoyed some gallery exposure as well as two years of experience as a schoolteacher. Now based in remote and distressingly underdeveloped Chiengi, the smallest and northernmost district in Luapula Province which just as many areas in rural Zambia is often cut off by rains, bad roads and lamentable telecommunications networks; Mabuku – who was recently in Lusaka -- shares the struggles of plying his trade as an artist and schoolteacher in the countryside. “It is not easy being an artist in the rural areas. You cannot exhibit; there are no galleries or buyers. I am also forced to avoid certain themes and styles. Not everything is acceptable, for instance I have given up carving sculptures because all forms of sculpture whether in stone or wood are considered a form of witchcraft in Chiengi,” he claims that witchcraft is very much a part of daily life in the district that borders the Democratic Republic of Congo and that the slightest suspicion of practicing sorcery can attract either a lynching by a mob or a contest by someone with more superior wizardry. “When I first came to Lupiya Primary School – which was formerly a basic school -- I was informed I should teach history and English and I did so in 2011. I later got some of my personal art materials and started working with pupils. But at least this time school management is really trying to support although help is minimal,” he says. 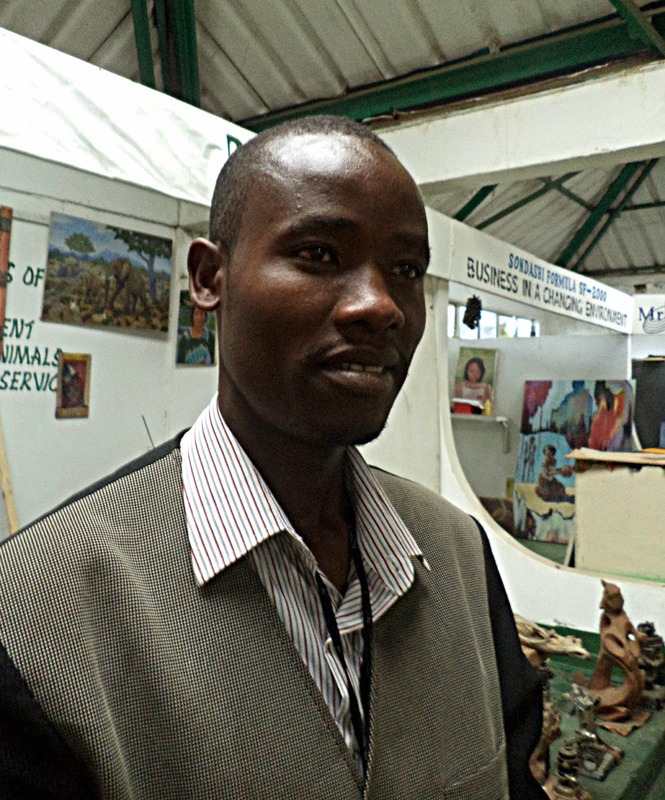 He is happy that school management eventually authorised him to teach art as a subject, but he appears more excited that this year art will be fully integrated into the school curriculum by the Ministry of Education countrywide. “There is a two career pathway some [pupils] will take the academic route and some vocational, so those who are doing arts will be doing it alongside other supportive subjects. I feel this one will help even for us in the rural setup,” he says “But government should also train more teachers of art because some of them [teachers] are teaching subjects for which they never trained. We have one teacher who did art at Northern College in Kasama but he is now teaching Religious Education, this has to change”. The enthusiasm as a young teacher is plain to see in Mabuku. He believes that artistic talent can help give even the most disadvantaged of children a future to earn a living from their creativity even if they may not perform well in other subjects which he observes is often the case in rural areas. He also observes a sense of sacrifice as Chiengi is not the most comfortable place to live in, having himself grown up in urban areas. “I have to travel to Mansa to collect my salary and I end up spending over K500 on transport and lodging. For the whole trip from Chiengi to Mansa it takes me over 10 hours. From Lupiya School – in Chiengi -- to the first main stop, Nchelenge we pay K100 and then from Nchelenge to Mansa we pay K80,” he recounts. There are no banks in Chiengi, and the nearest stop, Puta only handles money transfers from a small shop which is not reliable. The commuting takes up much of his monthly K800 allowance, an incentive he earns for living in a rural area. 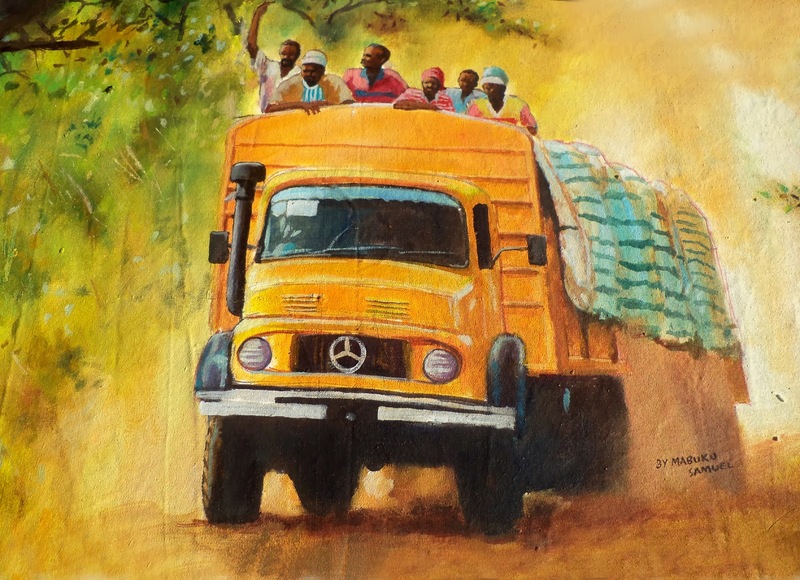 Although the journey takes a whole day, it is only about 400 kilometres from Nchelenge to Mansa but the roads are treacherous and bus operators will not risk taking their buses beyond Nchelenge so Mabuku and colleagues have to travel on the back of lorries, a scenario he often depicts in his work and can be seen in paintings such as Journey To Chiengi that portrays an old, long-nosed Mercedes Benz Truck laden with goods and passengers – the scene could easily be a picture from the 1960s. Journey to Chiengi speaks volumes on how underdeveloped rural Zambia remains while urban parts of the country have forged ahead with the construction of lavish hotels, shopping malls and housing developments; it is in short a time-warp to the 1960s, a shame really when you consider 2014 is the country’s Golden Jubilee year. Nevertheless, although Mabuku is in the process of pursuing a government scholarship to further his studies, at the moment he remains dedicated to improving the lives of rural children by nurturing a skill inherent in them and he – the illegitimate son of a military man -- sites his own unstable upbringing as proof that a child can overcome odds and get an education in art. Mabuku would later leave Mufulira to live with an uncle in Kitwe where he was encouraged to take art by a teacher he recalls as a Mr Munalula at Chamboli Secondary School. Upon completing Grade 12 in 2003 he obtained a division one in art and took up apprenticeship as a sign-writer around the city of Kitwe. Still under apprenticeship, he came to Lusaka for a sign-writing job and while here, he decided his future prospects lay in the capital so he moved in with an uncle in not-too-far Kafue. This is where he would meet artists Frank Kanjele and the celebrated painter Poto Kabwe – who also features in Oprah Winfrey’s personal collection – and it is Kabwe’s true-to-life style that appears to have a large influence on Mabuku’s work particularly his palette and subject matter. “Mr Poto Kabwe advised me to go back to school. He told me that I was still young and should go to Evelyn Hone College to study art because he himself went only up to grade form 5 and he encouraged me to try and do better. At the time he was working for the Kafue Textiles, where I joined him,” he says. But getting into college was not that easy, yet through sign-writing jobs, selling a few works at the Henry Tayali Gallery and the support of his uncle on the Copperbelt he was able to enrol in 2008. Fast-forward to 2014, we can only sympathize with Mabuku. It is hard enough to be an art teacher in urban areas, where even some of the best schools never have art materials so one can only imagine what Mabuku and other art teachers in the outskirts of Zambia go through. Likewise one can only wish all the rural-based teachers safety as they jump on the back of Lorries to access their salaries as well as comfort as they take up accommodation in mud huts while they boldly go about their noble duty of educating a nation. The past year had a variety of entertaining exhibitions but one of the smallest was certainly one of the most enjoyable and also lucratively successful regardless of its hodgepodge of mainstream artists and devoted Sunday painters. The “Small Works and Miniatures Exhibition” annually coordinated by passionate independent art promoter, Serena Ansley and her Red Dot Gallery at the Zebra Crossings Café in Lusaka outdid itself last year.